GMail Labs is consists of a lot of nifty and useful hacks and tools which can better your GMail experience by atleast 10 times. In case you are not yet using some of the GMail Labs features, then you should start right away. In this article we will tell you, How To Enable Or Disable A Labs Feature In Google Mail or GMail. Step 1. Log into your GMail account and go to the settings page by clicking on settings at the top right corner of the screen. Refer to the screenshot below. Step 2. From the settings page that opens, select the Labs tab. Refer to the screenshot above for details. Step 3. Now you can see a number of Labs features in the page that opens. A description has been provided next to each Lab feature for you to understand so as to what a particular Lab feature does. 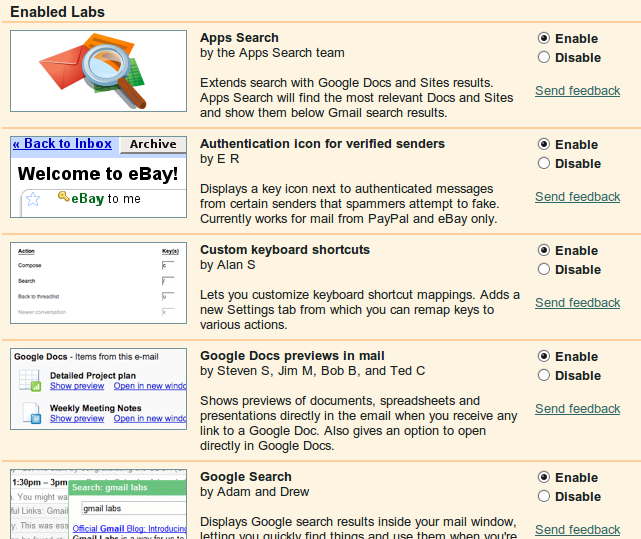 Now, search for the required GMail Labs feature. Step 4: Next to the Description, you will find two radio buttons ("Disable / Enable"). In order to enable a Lab feature just select the Enable radio button and click on Save to save your GMail settings. Step 5: If you want to disable a Lab feature just select the Disable radio button and click on Save to save your GMail settings. You will find that particular Lab feature won't be active anymore after the settings are saved.